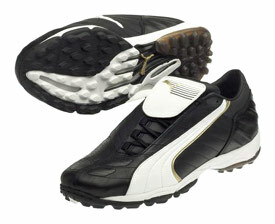 The Puma V Kat 2 TT Football Trainers are a full grain leather upper football trainer for use on astro and made made surfaces. The Puma V Kat 2 TT Football Trainers have off centred lacing a Grip Tex ankle lining and a TPU injected external heel counter with integrated support tapes for excellent stability. The e+Cell in the heel gives excellent cushioning and the Evertrack multi studded outsole in a Ground Control stud configuration offers superb traction.